Why did the Romans use roads? The Roman road system was one of their first sources of communication that started around 500 BC, and was a very important part in the development of Rome. These roads enabled the Romans to move their armies around quickly, and to trade goods all around their Empire. 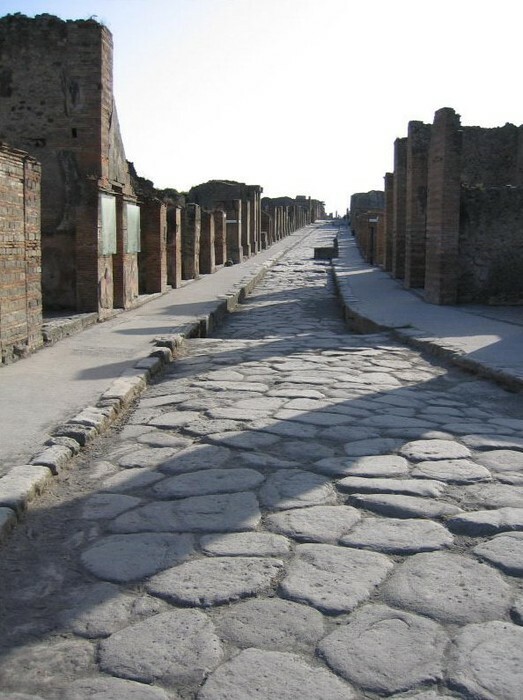 What a typical Roman road looks like. this shows the layers that make a Roman Road. This shows the Romans putting down the layers to build the road. How did they make the roads? The Romans, inherited some of the art of road construction from the Etruscans, and borrowed the knowledge of construction from the Carthaginians. The Romans made the roads in layers. The first layer would be compacted sand or dry earth. The second layer was crushed rock. The third layer was gravel in cement mortar. The forth layer was sand, gravel, and cement, and the top layer was large stone slabs. Also there was a curve on the surface of the road called the camber. The camber allowed water and other substance would wash off to the drainage ditches on the sides. They had there own version of signs, that had symbols of where they were turning on. Also they had to have passports on them when they traveled.